Knights forward Nyala Shuler on life as a student-athlete in her hometown. Redshirt senior forward Nyala Shuler ’17’s biggest fan at UCF women’s basketball games is also the person who inspired her future career as a pediatric doctor: her grandmother, Clementine. As a child, Shuler’s summer breaks from school were spent with her grandmother, a retired nurse. Shuler was fascinated by a nursing kit she kept in the house that had a stethoscope, thermometer and other medical equipment. “She still comes to a lot of the home games and sits behind the bench. It’s a really good feeling to be able to look at the stands and see her,” Shuler says. 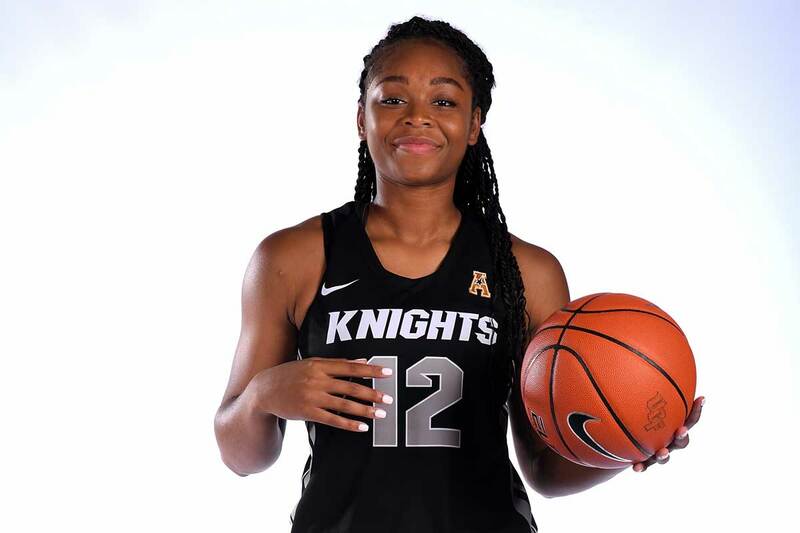 With a bachelor’s degree in health sciences already under her belt, the Orlando native and interdisciplinary studies graduate student has started every game this season for the Knights, who are off to their best start in the Division I era and receiving votes in the national polls. With a 17-3 record, including 6-1 in American Athletic Conference play, UCF is currently second in the league’s standings, behind only No. 3 UConn. When did you know you wanted to become a Division I student-athlete? In high school (Edgewater), we were cleaning out the garage and I found these old scrapbooks of my dad and my mom from their playing days. I realized, wow my parents were really good at basketball. It was that moment in the garage that motivated me to put in the extra work to get better and get a scholarship. What do you think it will be like when your basketball career is done? My mom talks to me every day about it: “You have to remember, your games are numbered.” Basketball has given me confidence and a competitive nature. It’s motivating to be around other women who are strong. I’m trying to mentally prepare myself for when it’s all over. I am going to take an MCAT course because I want to go to medical school, but I’m probably going to take a gap year first. I need experience in the work force, and I’ve never had a job in my life, so it’s going to be interesting to see how that goes. But for now, I’m focused on playing every game like it’s my last. I want to be able the leave the program on a good note. We want to turn it into a top 25 program. I hope Knight Nation will keep coming out to support us. That would be really great. They make such a difference. Who is a better shot blocker: You or UCF men’s basketball 7-foot-6 center Tacko Fall? UCF is your hometown team. What does that mean to you? That was part of the reason why I came here. It was to stay home and build something here. And it’s not just me who thinks that way. I have been watching [junior guard and teammate] Kay Kay Wright play since the eighth grade. [Men’s basketball senior guard] BJ Taylor is from Orlando. We’ve had football players from Orlando. I think we’re doing a really good job of getting people to come here. This is our city so why not try to build it up and be the best? If you could give yourself advice when you were a freshman in 2014, what would it be? “Perseverance is key.” That first year was really hard for me. I was so excited to play college basketball and then I got injured and basketball was basically taken away from me for the next eight months. I had to find other things that made me happy because I wasn’t able to play the game I love so much. School. And Netflix. My teammates and I watch shows together. We’ve been watching a show called You. I just finished one called Somewhere Between. I so excited for the sequel to To All the Boys I’ve Loved Before. (Freshman forward) Brittany Smith and I are going to watch it. [Women’s basketball forward Tolulope Omokore] and I have been watching Grey’s Anatomy. That’s probably one of my favorite shows of all time. I’ve seen every season. Derrick’s death hurt me so much. I stopped watching after his death for a couple months and then I was finally able to get over it and start watching again. I get connected to the characters so when they die or go off the show, I feel like part of me is just gone. The UCF women’s basketball team’s next game is Jan. 30 at 6 p.m. against Houston at CFE Arena. The first 1,000 fans will receive a mini Knugget bobblehead.